I received a bag full of Steeped Tea samples via a craft swap that I participated in, this is one of those samples. Pineapple Orange Cooler has an interesting smell to it. It reminds me of roses, citrus, and hibiscus. I had two sample tea bags/triangles, so I popped them both into my tea pot. I opted to do this because the triangles are less than half-filled with the tea (it didn’t seem like much at all!). The tea itself has nothing that is actually from the tea plant – the ingredients are dried apple pieces, rose hip, natural dried orange, hibiscus petals, and natural flavours. While oranges may be par of the ingredients, pineapples are no where to be found. I also can’t smell pineapples either, so I’m curious about how this tea will wind up tasting. I really like pineapples, which is why I picked out this one to sample next. The directions provided on the sample are to steep for 4-5 minutes in boiling water, which is exactly what I did. 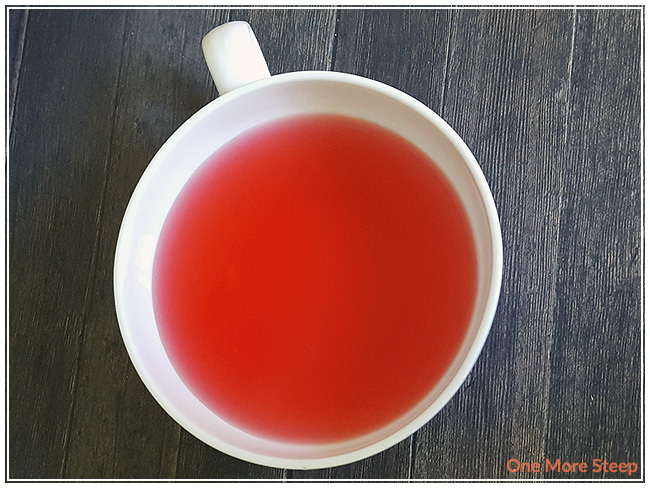 The tea steeps to a really nice dark pink, thanks to the hibiscus petals. It has an interesting smell to it – the fragrance has a hint of orange and a lot of the hibiscus floral notes to it. The taste is very interesting – there’s a tartness to it that I attribute fully to the hibiscus. It’s almost sour, it’s so tart. I don’t particularly find that it tastes like pineapples, but it does have some citrus notes to it. I don’t particularly like this tea when it’s hot, so I allowed the pot to cool before trying it again. At room temperature (and with ice! ), Pineapple Orange Cooler is quite refreshing. I still don’t taste the pineapple that’s allegedly in here, but the light citrus notes mingling with the strong hibiscus taste is quite nice. 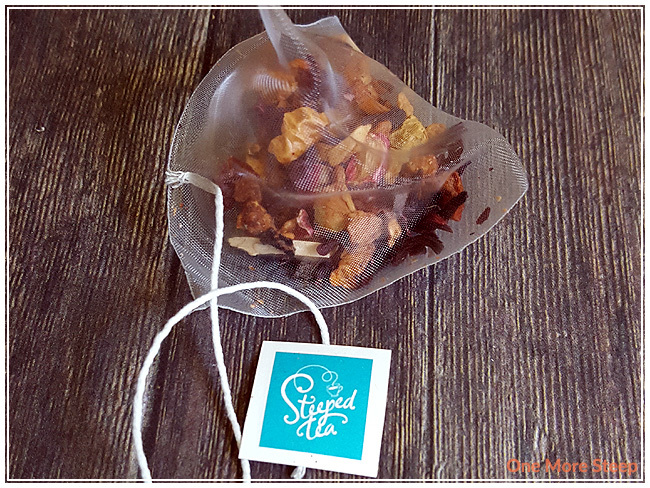 I generally do not resteep herbal/fruit infusions, it never tends to end well – this was no exception. I thought that Steeped Tea’s Pineapple Orange Cooler was just okay. I’m really disappointed that there wasn’t a stronger pineapple or orange presence in this drink. There was no pineapple to be had in the ingredients, in the smell, and in the taste. There was some citrus notes, but it could have been stronger, that’s for sure. I think that the Pineapple Orange Cooler works amazingly well as an iced tea, and I would definitely recommend having it cold. While it is tasty, I don’t think it’s something that I would want to necessarily keep a stash of in my tea collection, there’s other (better!) fruity drinks out there and the lack of pineapple is a bit of a sore spot since I like pineapple.